On December 18th, 2007, at age thirteen, Melinda Marchiano was diagnosed with Hodgkin lymphoma. Two days after Christmas, she began her first of four rounds of chemotherapy, followed by three weeks of daily radiation. When treatment ended, Melinda struggled with post-treatment effects; horrible digestive problems morphed into a life-threatening eating disorder that destroyed her physically, spiritually, and emotionally. During this time of recovery, she began writing her story in spiral notebooks. In October, 2010, Melinda’s book, Grace: A Child’s Intimate Journey Through Cancer and Recovery, was published. In May, 2011, Melinda accepted the Benjamin Franklin/Bill Fisher Award for Best First Book (Nonfiction) and a Silver Medal Ippy Award. 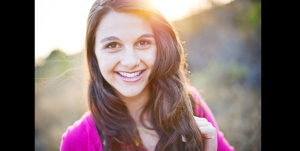 Melinda Marchiano resides in Malibu, CA where she attends Pepperdine University as a Creative Writing major. She is deeply involved with the university’s dance company as a student director, choreographer, and performer in Dance in Flight: The Film. Melinda regularly brings her message of hope to others as an inspirational speaker. During the summer of 2011, Melinda traveled over 7,000 miles, through 28 states, and visited 15 children’s hospitals in what she named the Children’s Hospitals Hope Tour. The following summer, she made a similar journey—visiting patients, giving presentations at hospitals, and speaking with the media to raise awareness for childhood cancer. Melinda gives generously of her time, out of her passion to help others fighting cancer. She hosted the powerful childhood cancer documentary, The Truth 365, and speaks for multiple cancer organizations as well as various church, support, business, and school groups. Melinda is excited about her future plans to continue dancing, writing, and working to end childhood cancer. 1. Please update us on your achievements since your 1st interview in April 2011. Among your successes, you’ve received the “Hope Award’ and you’ve written “The Truth 365”. Melinda: Wow, a lot has happened the past three years! I graduated from Nipomo High school in June 2012 and am now attending Pepperdine University as a Creative Writing major. I will be entering my Junior year in the Fall. I’ve had many amazing opportunities to share my experience and advocate for children with cancer—I’ve spoken for organizations such as Children’s Miracle Network, American Cancer Society, Teddy Bear Cancer Foundation, and more. In the summer of 2011 and again in 2012, my mom and I went on what we called “The Hope Tours”. The first, in which we drove over 7,000 miles and visited 28 states, brought us to 15 different children’s hospitals where I spoke and visited with kids and their families. It was truly a trip I will always remember! The following summer, we undertook a similar journey, this time through states on the West coast. The Make A Wish foundation sponsored our trip and created an incredibly meaningful and unforgettable time! I was honored to be recipient of the 2012 Hope Award through Arms Wide Open Childhood Cancer Foundation. This foundation works endlessly to advocate for less toxic treatments for kids with cancer—I am very grateful for what they do and am very humbled to be recognized as someone who has had an impact in the childhood cancer community by those who I respect so much. The Truth 365 was actually a Childhood Cancer documentary that I was asked to host. I flew to Washington D.C. to film various parts for it in September of 2012. One last experience that I was so fortunate to take part in was a dance film called Dance in Flight: The Film. The dance company at Pepperdine filmed the movie last summer—it tells the real-life stories of eight dancers and the influential role it has played in their life. I was able to share my cancer experience and even re-shaved my head for re-enactment purposes! However, it wasn’t too long at the time, just a few months before I shaved it to raise money for pediatric cancer research through the St. Baldrick’s Foundation! It has been a whirlwind of amazing opportunities and experiences! Melinda: As you can imagine, a typical day for me varies quite a bit depending on whether or not it is during the school year. Both, however, start at about 8am with a good breakfast and some time reading my Bible. During the school year, it typically continues on like this: classes mid-morning to mid-afternoon with library/studying time in between, cross-training/conditioning for dance in the afternoon/evening, more studying, and possibly dance rehearsals at night. I tend to complete more “business” type tasks (emails, etc.) as I’m walking around campus and from class to class. This summer, my days have been more like this: Advocacy work/emails, etc. mid-morning, workout midday, have a yummy lunch, write, nap (they help so much with life! ), dance class(es) in the afternoon/evening, time with my family at night. It has been great to have some rejuvenation time! 3. What was the best advice you received when you started college? Melinda: The best advice I received, oddly enough, was “just do your best”. There’s a tremendous amount of unnecessary pressure that college students feel to “keep up” with everyone else. Often times every mediocre paper or unfortunate exam grade is seen as being detrimental to that person’s entire future. Additionally, many of my fellow students come from a background of seeing nothing but A’s on report cards—all of a sudden just turning in assignments and showing up isn’t enough. I’ve learned more of the truth in “just do your best” as I’ve struggled (and seen others struggle) with obsessing over perfection and the end goal of “creating a future”. This advice has helped me to, strangely enough, take more away from my classes and lead a more balanced life as a college student. Above all, it has helped me to enjoy the college journey much, much more. 4. What are your strategies for building awareness your book ‘Happy Quail” for the short term and the long term? Melinda: Happy Quail is actually the name of our publishing company while the book is entitled, Grace: A Child’s Intimate Journey Through Cancer and Recovery. The effort to raise awareness of the book, thankfully, goes hand in hand with simply sharing my story. Short-term, we have speaking engagements and other various events on the agenda. In terms of the future, a second edition of the book is underway, with a re-release planned for early next year. With this, we hope to reach larger audiences in the Christian market as well as through healthcare and educational outlets. Melinda: That’s a very difficult question for me. I can’t do anything without the help of God—I feel so grateful and fortunate to have had many successes. Above all, I would say that my proudest achievement is not letting cancer hold me back from love, joy, and happiness. Even now, as a survivor, I am faced with daily challenges—both emotionally and physically—that are a result of my cancer treatments and overall experience. The daily decision to not let it suffocate my life and keep me from living out my calling is, I believe, the most fundamental achievement of all. Melinda: I love what United Blood Services does! I received two vital blood transfusions during my treatment and now have a whole new appreciation and respect for those who donate blood! I also really love Be the Match, which is a registry for potential bone marrow donors. Although I was fortunate enough to not need a transplant, kids who do are often faced with an extensive search for donor who is a match. Be the Match assists in connecting patients in need of a bone marrow transplant to those who have been tested and are listed under the registry as donors. 8. Who has influenced your career ambitions the most? Melinda: Originally, I was inspired by Dr. Joshua Schiffman, a pediatric oncologist who survived the same type of cancer that I had (Hodgkin lymphoma) when he was fifteen. I thought that the idea of coming full circle was so beautiful! Having loved science all of my life, I began at Pepperdine as a Biochemistry major under the Pre-Med curriculum. However, I slowly felt more and more called to write and dance and began to develop a newfound love for each. I am very grateful to have been led down the Pre-Med road—if I hadn’t been, I would have not discovered this. Now considering dance and writing, I have been most influenced by my mom, who is always ready to remind me that God has given me a special affinity for the two. 9. What is your advice for anyone recently diagnosed with cancer? Melinda: I would ask them this question: What do cherish? Believe in? Find those things and hold on to them tight—they are the things that cancer can never take away. They are the things that will get you through the toughest moments.